Although we have simulated 20000 datasets,i only plot the results for 5000 simulations (for clarity and to keep the optician at bay). The black lines which meet at the red circle represent original sample estimates.The blue circles represent simulated results.The percentages in each quadrant capture the portion of simulated results more extreme than sample estimates. The green triangle marks the location of the null hypothesis (e.g. b(r)=0 and b(d) =-0.1 in the case of the original sample). 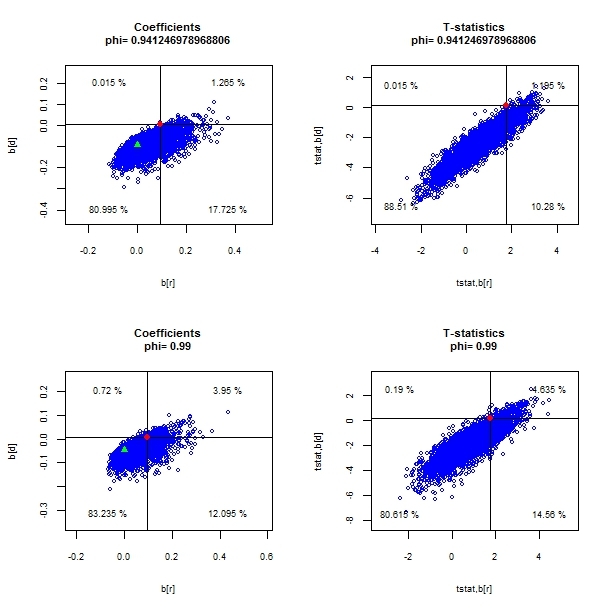 return coefficient from simulated data > return coefficient from sample data. dividend growth coefficient from simulated data > dividend growth coefficient from sample data. If we ONLY look at the marginal distribution of the simulated return coefficients (br) we would find weak evidence against the null hypothesis since the monte carlo draw produces a coefficient larger than the sample estimate around 19% of the time (top right + bottom right quadrant).Coefficients larger the original sample estimate are to be seen even if the true underlying coefficient is zero. If we look at the joint distribution,most of the events with more extreme return coefficients are paired with dividend-growth forecast coefficients that are more negative than seen in the data (bottom right quadrant). In these events,both dividend growth AND returns are forecastable. Here prices are moving partially on forecasts of future dividend growth and in the right direction. Dividend growth fails to be forecastable in only 1.27% of the samples generated under the null (top right quadrant). The absence of dividend-growth forecastability offers stronger evidence against the null. If I understand this correctly,the dividend-growth variable is the dog that did not bark, given that it is the absence of its forecastability that provides a stronger evidence against the null hypothesis than the presence of return forecastability.The absence of dividend growth forecastability can be thought of as evidence that return forecastability is economically significant.In other words,if we wanted to prove that returns are forecastable in the short run,the lack of dividend growth forecastability is more compelling than the presence of return forecastability for achieving that purpose. Although the t-statistics and standard errors are missing from this table (because i do not know how there are determined),they would,according to the paper, be exactly identical. Hence one advantage of using long-horizon regression coefficients is that they obviate the need to choose between return and dividend growth tests (as was the case in single period regressions). The last column shows our conventional probability values,essentially telling us : how many forecasts are greater than the sample value under the unforecastable null hypothesis.There is a 1.43% chance of seeing a long-run forecast more extreme than seen in the data. Ultimately,the long-run return AND dividend growth regressions give essentially the same strong rejections as the short-run dividend-growth regression. 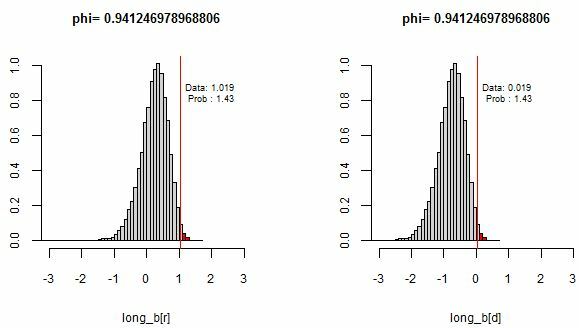 As a consequence, we can tabulate the small-sample distribution of the test in a conventional histogram rather than a two dimensional plot.